An alarm sounds. This morning you desire clear-headedness, but not over stimulation. Coffee is a bit too much. Tea is not enough. Instead, you turn to the goldilocks of caffeinated beverages: the beautiful, native yaupon tree. Our Rouse loose leaf yaupon tea is a nutty, light, and flavorful beverage for the mornings when you need a little push, but not too much. Yaupon is the only native plant with caffeine in North America. 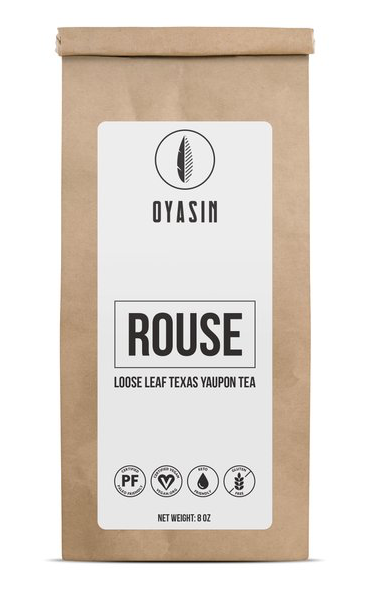 Each bag of Rouse is 8 ounces of loose yaupon leaves. This yields approximately 60 cups. Coffee is great, but drink it daily and watch how the alertness and stimulation fades. To replace concentration, you get adrenal fatigue and chronic stress. In contrast, a delicate green tea is light, but with too little caffeine. It is mild, but without enough stimulation to get you going. Yaupon is different. This nutty-flavored tea provides about 65 - 70 mg of caffeine per serving making it stimulating, but not overwhelming. Yaupon is the best of coffee and chocolate. Aside from just the right amount of caffeine, yaupon also has a compound called theobromine, which you may know from chocolate (cacao). Theobromine is a mild stimulant that has numerous cognitive effects. This provides a unique form of stimulation only possible through the yaupon plant. Coffee is native to Africa, tea is native to east Asia, and yaupon is native to North America. The indigenous Cherokee natives called yaupon “the beloved tree”. This evergreen was revered and appreciated as a vital tool. Texas is a hotbed for yaupon trees. We harvest our yaupon tea less than one hour from Oyasin headquarters in Austin, Texas. "Well rounded flavor like many high quality teas... native to the US, good little caffeine boost and smooth. I make mine with a French press and add a touch of honey."